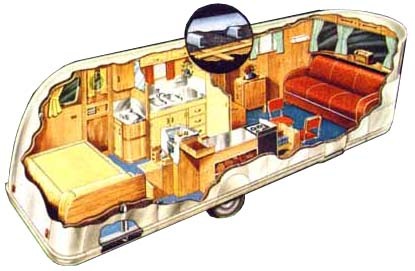 This cutaway view of a manor shows the typical layout of the trailer. The paneling is attached to the aluminum frame with steel screws. 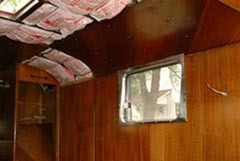 The space between the exterior wall and the interior paneling was insulated with Kimsul, a paper fiber batting material. One of the problems with this type of insulation is that it tends to wick and hold water when leaks occur. In this 46 restoration there was interior water damage to the quarter cut ribbon striped Sapele Mahogany paneling. (used only for the first year of production due to the high cost of the material) The solution was to remove each panel and strip the damaged varnish off. then lightly sand and finish each panel with several coats of a marine grade polyurethane then reinstall them. This photo shows a section of the damage in the ceiling. 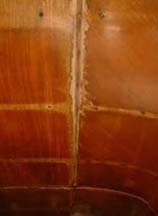 The joint strips have been removed to show the water damaged finish. Before any refinishing was done all leaks in the trailer had to be sealed. I used a liquid seam sealing product called Capt. Tolly's. This is a marine product which has a capillary action by which it draws itself into the crack and hardens. Vulkem 116 Sealant was used for larger seams.. Another option is to coat the interior with a gas tank sealer such as POR-15. to create a water tight seal. This shot shows a panel removed with the original Kimsul insulation showing. The window channels were also replaced to prevent further water damage (new material can be order through JCWhitney). When replacing the paneling it is very important to use mounting strips on the aluminum framing. In the Summer this framing heats up and if there is not anything between your paneling and the framing your finish will be compromised. Note the lines in the original time damaged panels. I used strips of 1/8 masonite ripped to approximately 1" wide. I found that hot gluing these strips to the frame was the best method of holding them in place until the paneling is screwed to the frame. This photo shows new fibreglass insulation and new electrical wiring with several replaced panels. They are installed with #8-32 stainless screws. A couple of areas in the trailer had too much damage to use the original paneling. I replaced those pieces with 1/8" plywood veneered with mahogany and finished to match the original. Updates or changes in my restoration are noted in green.